These days, slowing down could be considered radical. It’s definitely countercultural. When our predominant culture prioritizes being busy, major productivity and multi-tasking, the idea of slowing down can be ironically overwhelming. People just don’t know how to relieve the stress that comes with all this busy-ness. Yet, what I observe in almost every yoga class I teach is that people are both exhausted and craving more energy. So many are living with ongoing anxiety. Work stress is through the roof. News overload is taxing our adrenals. We all need to take time to refill our tanks, to slow down, to refuel, to undo the effects of stress. But how can we do this really effectively? Here’s the answer I’ve come up with: Rest first. Several months ago, I began starting all of my yoga classes with a guided Savasana (Corpse, or conscious relaxation pose). I was hesitant at first, since those that come to my classes were used to a more energetic start, but I quickly learned this new beginning feels like an amazing gift. It doesn’t matter if it is a restorative class, a group of power yoga instructors, or a private session, a guided Savasana in the first five minutes of class positively changes the quality of all practices thereafter. Why is Stress Management Important to Wellness? When we begin with conscious relaxation, the energy in the room settles down. Then when we start to move, the movement blossoms from a place of greater stillness (and self-awareness). Each person is a more connected to their inner self and a less to how they are perceived. They are less concerned with what they need to do next, or that jackhammer that just started outside the studio. People may arrive in with a whirlwind of noise, chatter and stress, but this opening Savasana immediately changes that energy. It effectively anchors students not only into the room, but in the here and now. In Savasana we are able to hone our skill of interoception; shifting our attention from the world around us to becoming more attuned to what’s going on in our own bodies, our minds, our souls. Like the pause in Mindfulness practice, it is in Savasana that we pause before action. Slowing down first will build greater inner awareness so you can access nuances of sensation and become more subtly effective both on the mat, and in the outer world. By employing this conscious method of relaxation we engage our parasympathetic nervous system, giving our organs a chance to slow down and rest, while activating our digestive and healing process. Coming to stillness is not easy though, it is a skill that must be learned and practiced. 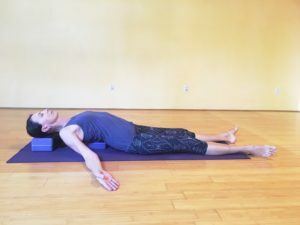 At the beginning of class, most of us need some direction and assistance to enter into down regulation and reap the benefits of this supine pose. In addition to tapping your favorite resources for guided meditation (or attending the Yoga Tune Up® Breath & Bliss Immersion Training), here are a few restorative yoga practices to quickly induce relaxation. If you’re a teacher, try offering the below to your students. If you’re a practitioner, arrive to your class or workout a few minutes early and guide yourself! Gently rest your hands on your abdomen. Fingers spread. Light touch. Notice the gentle rise and fall of your fingers against your belly as you breathe. With little extra effort, inhale and feel your belly rising — like a balloon, exhale letting go. Inhale, belly rises, exhale, it falls. Inhale, belly fills up, exhale release. Continue. Abdominal Breathing is also a lovely go-to self-care practice, giving a moment to pause and clear. 2. If props are available, create deeper relaxation by starting with a supported pose. Supported Fish Pose is definitely a favorite — giving a much needed release to cell phone weary necks and shoulders. Check out last week’s post to learn more about how powerful supported poses are and some creative ideas for props. 3. Finally there is the Yoga Tune Up® Sub-Occipital Release. It is pure bliss for me when a massage ends with the therapist pressing into that place at the base of my skull where my spine and skull come together – a bony landmark called the occiput. My jaw releases, my mind melts. So, why not include this lovely treat in your beginning rest practice? It is easy to do this using toted Yoga Tune Up® therapy balls and a block (or thick book). When you practice something, it becomes second nature and eventually you find yourself doing it without thinking. What if you were able to stop yourself before you got caught up in the whirlwind of the moment? What if you automatically took a breath, found that calm clear place within, then acted from your center, from your optimal self? What if you cleared enough of the old habits of mind away that you could slice through to the wisest most balanced decision with clarity and ease? I get chills of excitement when I think about living like this. This is the difference between reacting and responding. Translate this new internal super power to that difficult conversation, the meeting you are walking into, or the (please fill in the blank) and you will access a whole different kind of power. Pause, take a moment, find your center and then act. Now that is powerful. I typically turn on the news when I wake up and lately I’ve realized that I’ve been starting my day stressed out. I need to add these relaxation techniques so I include conscious relaxation in my day. Oooh! Never thought of doing Savasana at the beginning of a class. It def makes sense though, moving from a place of stillness. I would def appreciate this in a class, especially when I’m running late and rushing to get to the class through traffic. And YES, being able to respond from a place of self-induced stillness and calm is so powerful! Thank you for sharing. Wonderful to get reiterated to be more than just that one aspires to become. Ever since I started to enjoy the process and try to detach myself from the outcome my body thrives. Weight comes off, sleep is profound and calmness radiates. Hi Pamela! Thank you for sharing this article. As a yoga teacher in training, it is really important to be thinking about the different kinds of classes I want to teach, and to really consider the holistic impact of my class on my students, rather than just what kinds of physical feats I can help the achieve on the mat. Beginning a class with a down-regulating, breathing exercise will do wonders for people racing around the city all day. Thank you for these exercises – I look forward to teaching them! In Savasana we are able to hone our skill of interoception. Key point. Thanks! Excellent article. yes, I like to start my classes with a “mini” shavasana….it helps people leave the stress “outside the door” and turn inward. Thank you for this inspiration, Pamela! I absolutly agree that slowing down is countercultural and so important. I usually start with quitness and a meditation my calm (yin) yogaclasses. Everyone seems to enjoy calming down at the beginning, including me before I start teaching. I absolutely love this suggestion! You’ve written an inspiring blog post and I can’t wait to try it. Thank you! A splendid and timely article. I can definitely relate to the phrase “the idea of slowing down can be ironically overwhelming.” A sobering reminder that stress often gets into our deep recesses, subverting our senses and leaving us with a parody of an internal connection to self. Thank you for sharing these wonderful insights and immensely helpful techniques. Wow! Juste by reading your article I was already calming down and connecting deeply with my inner space! I really love the idea of a 5 minute guided savasana at the beginning of a yoga class. Even if its power yoga! Thank you for this thoughtful and beautifully written article. You had me at the title, and brought it home with the notion of ‘practice’. Has me thinking….When ‘doing’ is always results oriented, we need reminders and guidance to stay in the actual ‘doing’ ….flow. Results, perhaps, of a different kind. Will definitely be saving & re-reading this one. Thank you. We are kindred spirits! 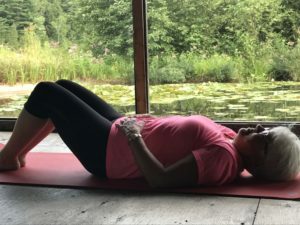 I start my classes this way as well – it’s all about being conscious of our transitions in life, and the transition of rushing to yoga to lie on the mat is one of the more challenging ones. I loved your tips and analogies. Incredibly helpful and so well written! Thank you for these techniques! Very beautifully written article. thanks for your sharing! I love the idea of preemptively deactivating the stress response by tuning into the breath when a moment of anxiety is creeping up. I too get chills imagining this as my base response, as opposed to the shortened breaths, rapid heart rate, and clenched jaw. Savasana was given to me as my peak pose in my recent YTU Level 1 training, and I am listening to this roar from the universe! I will be lengthening the settling-in phase of classes that I teach, and giving myself more baths in the morning:) thanks for all the ideas! I am a licensed social who does counseling w individuals of all ages. I found so many of your observations and techniques to address stress to be increbily spot on and helpful for my practice! Thank you! I devoured this article, scribbling notes, getting excited to bring some of these ideas into my classes… and then realized afterwards who the author was! Beautifully written and just the reminders I needed not only as a teacher but as a busy, stressed, anxious human being myself. Great to see you doing wonderful things, Pam! Thank you! I am wanting to really teach my students more functional movement, relaxation and more of what is really great for them. I am nervous to transition from my current style of teaching to integrate all the new. A much appreciated boost of confidence!